These cookies and cream Oreo pops should hold a special place in your "Cool Whip recipes" file. 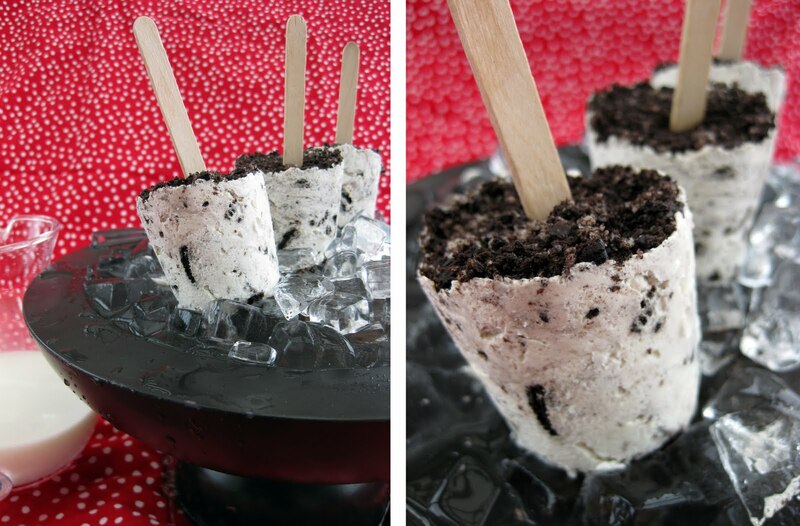 These Oreo pops are a WIN! They're delicious --- not to mention criminally rich compared to last week's melon popsicles. Basic popsicle recipe: Oreos and cool whip get into a delicious brawl. You freeze the action and eat it. This recipe is also a good way to let out some frustration and sooth the nerves. Step first: Smash up a bunch of Oreo cookies. Step last: eat popsicles until you feel better. All around great program for emotional repair, should you need any. 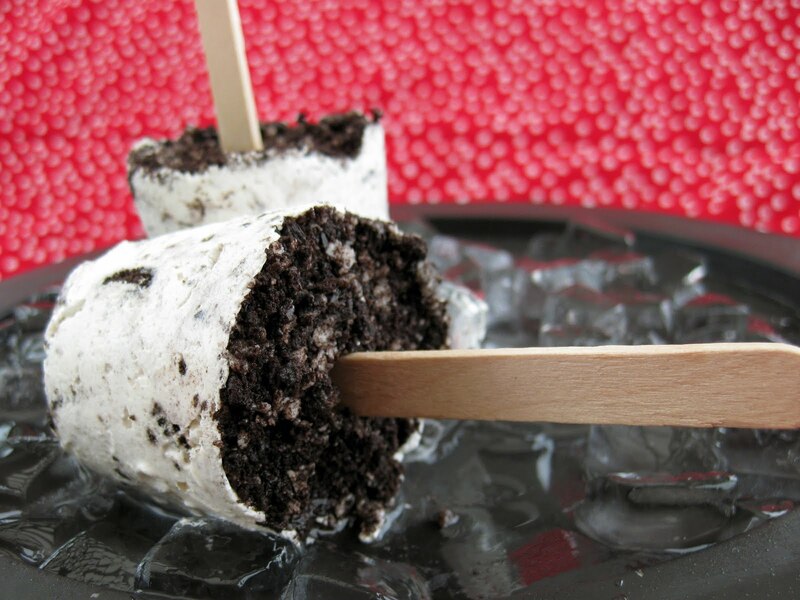 Cookies and Cream Popsicle Recipe...a creamy popsicle that's easy to make. In any case, these Oreo pops turned out wonderfully and my guests were very happy. They disappeared quickly, too (the cookies and cream popsicles, not the guests). Reasons? 1) Delicious, and 2) Cool Whip's mystery ingredients keep them bite-ably soft, so you can chow down instead of nibbling patiently. 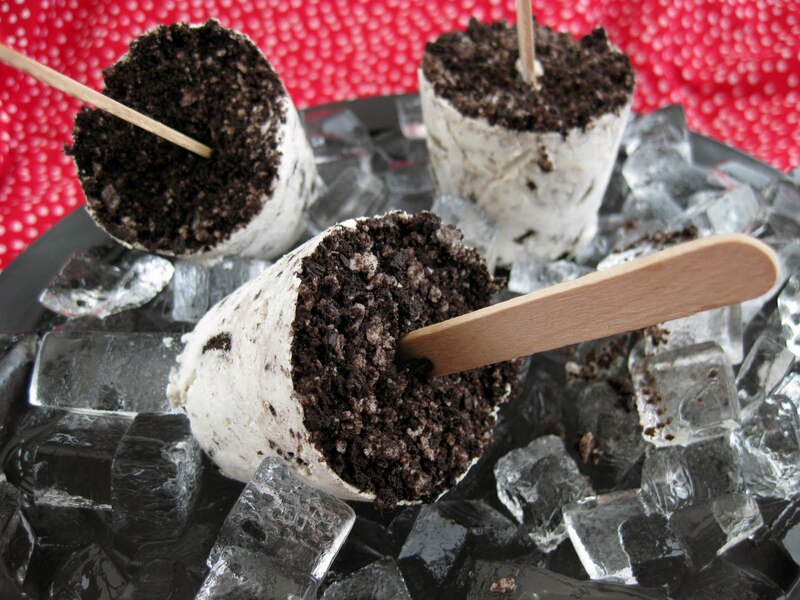 This Oreo popsicles recipe is an easy cool whip dessert that tastes delicious. Not all dixie cup popsicle recipes make pops that are easy to get out of the dixie cups. With these ones, it's simple: You just grab the edge of the dixie cup and tear it away. Put the Oreo cookies in a ziplock bag and destroy them with something until they're broken into medium-large chunks. Put all of the chunks in a pasta strainer that has pretty big holes in it, and sift out the fine cookie dust. Save the dust for later. Sifting helps you in two ways: 1) It keeps the "cream" part of the popsicle from turning gray when you mix everything together, and 2) You can save the fine dust for decorating the top of the pops before you freeze them. Stick the cream cheese in the microwave if you need to soften it up a bit more. Then, put it in an electric mixer with sugar and vanilla and whip until smooth. Fold in the Cool Whip, then fold in the cookie chunks. Fill your popsicle molds or dixie cups. I used 3oz paper dixie cups, and the mixture was thick, so I had to carefully fill the cups to avoid trapping air bubbles (as a result, this recipe takes longer to make than last week's pour-n-freeze melon popsicles). Add the popsicle sticks or plastic spoons - the batter is thick enough to hold them up - then pour fine cookie crumbs on top of each popsicle and press down a bit so they stick. Freeze these for at least 4 hours for best results, though they'll never get rock solid. To remove the dixie cups, just peel them off. 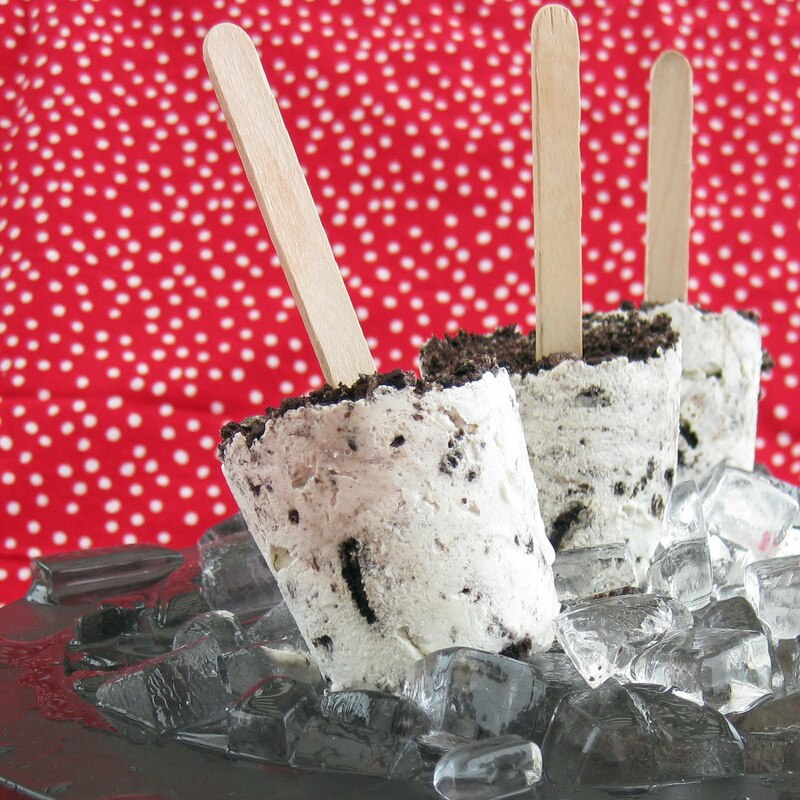 This Cookies and Cream Popsicle Recipe makes a delicious, creamy popsicle. Now do a paleo-friendly version with homemade ice cream and Oreos! Do it! Can I use something else instead of cream cheese? Hmmm, cream cheese is kind of the heart of the recipe, but you could try using a thick greek yogurt, maybe even a sour cream, and see what happens. Hope this is helpful! This looks great! Try it for kids outside eatin' !